Thank you to all of the NPs who made the 9th Annual NPO Pharmacology Conference a success! It was a great day of education. Find a nurse practitioner in your area using the NPO Online Directory. 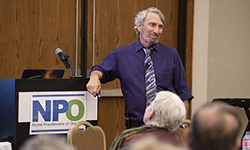 NPO is seeking poster presenters to provide evidence-based educational topics at the 42nd Annual NPO Education Conference, on Wednesday, Oct. 16 in Eugene.